hDepartment of Diagnostic Imaging (J.L.B., G.B. ), Rhode Island Hospital and Warren Alpert Medical School of Brown University, Providence, Rhode Island. BACKGROUND AND PURPOSE: DSC-MR imaging using preload, intermediate (60°) flip angle and postprocessing leakage correction has gained traction as a standard methodology. Simulations suggest that DSC-MR imaging with flip angle = 30° and no preload yields relative CBV practically equivalent to the reference standard. This study tested this hypothesis in vivo. MATERIALS AND METHODS: Eighty-four patients with brain lesions were enrolled in this 3-institution study. Forty-three patients satisfied the inclusion criteria. DSC-MR imaging (3T, single-dose gadobutrol, gradient recalled-echo–EPI, TE = 20–35 ms, TR = 1.2–1.63 seconds) was performed twice for each patient, with flip angle = 30°–35° and no preload (P−), which provided preload (P+) for the subsequent intermediate flip angle = 60°. Normalized relative CBV and standardized relative CBV maps were generated, including postprocessing with contrast agent leakage correction (C+) and without (C−) contrast agent leakage correction. Contrast-enhancing lesion volume, mean relative CBV, and contrast-to-noise ratio obtained with 30°/P−/C−, 30°/P−/C+, and 60°/P+/C− were compared with 60°/P+/C+ using the Lin concordance correlation coefficient and Bland-Altman analysis. Equivalence between the 30°/P−/C+ and 60°/P+/C+ protocols and the temporal SNR for the 30°/P− and 60°/P+ DSC-MR imaging data was also determined. RESULTS: Compared with 60°/P+/C+, 30°/P−/C+ had closest mean standardized relative CBV (P = .61), highest Lin concordance correlation coefficient (0.96), and lowest Bland-Altman bias (μ = 1.89), compared with 30°/P−/C− (P = .02, Lin concordance correlation coefficient = 0.59, μ = 14.6) and 60°/P+/C− (P = .03, Lin concordance correlation coefficient = 0.88, μ = −10.1) with no statistical difference in contrast-to-noise ratios across protocols. The normalized relative CBV and standardized relative CBV were statistically equivalent at the 10% level using either the 30°/P−/C+ or 60°/P+/C+ protocols. Temporal SNR was not significantly different for 30°/P− and 60°/P+ (P = .06). CONCLUSIONS: Tumor relative CBV derived from low–flip angle, no-preload DSC-MR imaging with leakage correction is an attractive single-dose alternative to the higher dose reference standard. Continued effort toward harmonization includes a recent American Society of Functional Neuroradiology white paper recommending a 60°–70° flip angle, field-strength-dependent TE, and one-fourth-to-full-dose preload with a full-dose bolus.14 Yet a more recent constraint is that DSC-MR imaging paradigms comply with the standardized brain tumor imaging protocol,15 requiring postcontrast imaging to be performed after 1 full dose of gadolinium-based contrast agent, either split between the preload and DSC-MR imaging bolus before postcontrast imaging or given fully as a preload with variable-bolus-dose DSC-MR imaging after postcontrast imaging. To further assist effort toward DSC-MR imaging harmonization, two independent studies using sophisticated computer simulations were recently performed,16,17 one of which used a glioblastoma-trained digital reference object permitting an exhaustive search of many possible combinations of acquisition parameters under a range of simulated physiologic conditions.17 This search revealed that the American Society of Functional Neuroradiology parameters with flip angle = 60° and TE = 30 ms had excellent accuracy and precision at both 1.5T and 3T for single-dose preload and bolus, but substantially degraded performance for fractional dosing schemes, and especially poor performance without preload. However, DSC-MR imaging without preload but with a comparatively lower flip angle (30°) and a midrange TE (30 ms at 3T) performed nearly as well as the double-dosing scheme, but also very well for fractional dosing schemes and even without using any preload dose. While this theory is promising, data are lacking to support it. Therefore, this study aimed to confirm these simulation results in vivo and to determine whether single-dose, low–flip angle DSC-MR imaging without preload gives rCBV estimates practically equivalent to double-dose, intermediate–flip angle DSC-MR imaging with full-dose preload and bolus in patients with contrast-enhancing brain lesions, including gliomas. Adoption of this protocol would eliminate preload contrast agent injection and reduce contrast agent usage. All participants provided written, informed consent according to institutional review board policy in this Health Insurance Portability and Accountability Act–compliant study. Patients diagnosed with a brain tumor or vascular malformation who were scheduled for a clinically indicated DSC-MR imaging were considered for inclusion in this 3-institution (Medical College of Wisconsin, Rhode Island Hospital, Mayo Clinic Arizona) prospective study. The lesion was required to be at least 1 mL, and the DSC-MR imaging data had to be of sufficient quality with a discernable signal transient without large motion artifacts to ensure a robust comparison between DSC methods as applied to lesion tissue only. All studies were performed on 3T MR imaging systems (MAGNETOM Skyra (Siemens, Erlangen, Germany), MAGNETOM Verio (Siemens, Erlangen, Germany), PET/MR (GE Healthcare, Milwaukee, Wisconsin) and two Discovery 750W systems (GE Healthcare, Milwaukee, Wisconsin). Figure 1A depicts the image-acquisition protocol. Following standard precontrast FLAIR and T1-weighted spin-echo imaging, we performed low–flip angle (30°) DSC-MR imaging (gradient recalled-echo EPI, TE/TR = 20–35 ms/1200–1630 ms) without contrast agent preload (P−) using a bolus injection of 0.1 mmol/kg of gadobutrol (Gadavist; Bayer Schering Pharma, Berlin, Germany). Additional DSC-MR imaging scan parameters included the following: FOV = 220 mm, matrix = 96 × 96 or 128 × 128, slice thickness = 4–5 mm, skip = 0 mm. Subsequently postcontrast T1-weighted images were obtained according to the clinical protocol of each site, and a second DSC-MR imaging was performed using an intermediate flip angle (60°) and otherwise identical acquisition parameters. The time between the first and second DSC-MR imaging study was 5–8 minutes. By virtue of the acquisition order, the second DSC-MR imaging was performed with a contrast agent preload (P+) provided by the first DSC-MR imaging bolus. For both DSC-MR imaging datasets, 120 time points were collected and gadobutrol was bolus-injected (3–5 mL/s) after 40–60 baseline images. When the DSC-MR slices were not an exact subset of the T1-weighted image slices, an additional T1-weighted “reference” scan was obtained using a slice prescription (orientation and spacing) matching the DSC-MR imaging examination for ease of coregistering the DSC-MR images to the anatomic images. Acquisition protocol with postprocessing options. A, After precontrast standard imaging is performed, a standard dose of gadolinium contrast (0.1 mmol/kg) is administered during which DSC-MR imaging data are collected using gradient recalled-echo–EPI with a flip angle (FA) of 30° and TE = 30 ms. This first contrast agent injection serves as the preload (P+) for the second DSC-MR imaging acquisition. Next, postcontrast anatomic images are collected, followed by the second DSC-MR imaging acquisition during which a second dose of gadolinium contrast (0.1 mmol/kg) is administered. Finally, an anatomic reference (Ref) scan is obtained using a slice prescription that exactly matches the DSC-MR imaging slice prescription. B, Given the order of the data collection, 8 different rCBV maps can be created for each subject that include both normalized and standardized rCBV for each of these 4 conditions: 1) 30°/P−/C−, 2) 30°/P−/C+, 3) 60°/P+/C−, and 4) 60°/P+/C+. All imaging data were anonymized and postprocessed at a central site (Medical College of Wisconsin) using OsiriX Imaging Software (http://www.osirix-viewer.com) with IB NeuroTM and IB Delta SuiteTM plugins (Imaging Biometrics, Elm Grove, Wisconsin). Both normalized (nRCBV) to normal-appearing white matter (NAWM) and standardized (sRCBV)18 maps were created. The NAWM ROI, selected by 1 person (M.A.P. ), comprised two 8-mm-diameter circular ROIs placed on 2 separate image slices at the midventricular level within the normal brain near the frontal horns of the lateral ventricles. When this area was abnormal, the ROIs were drawn near the occipital horns. Standardization is a unique machine-learned calibration rule19 that yields quantitative rCBV maps with consistent values across time and patients.20 Unlike nRCBV, the creation of sRCBV does not require the determination of a reference ROI. Both nRCBV and sRCBV maps were created for DSC-MR imaging datasets obtained without (C−) and with (C+) application of Boxerman-Schmainda-Weisskoff leakage correction previously described in detail10 and implemented in a vendor-specific fashion by IB NeuroTM. Therefore, 8 different rCBV maps were created for each subject, including nRCBV and sRCBV for each of 4 conditions: 30°/P−/C−, 30°/P−/C+, 60°/P+/C−, and 60°/P+/C+. Using the IB Delta SuiteTM, we defined contrast-enhancing lesion volumes from quantitative dT1 (delta T1) maps, computed from the difference between calibrated and registered post- and precontrast T1-weighted images.21 The quantitative dT1 maps facilitate visualization of the enhancing lesion, free of intrinsically increased T1 signal from blood products or proteinaceous material. Because dT1 maps are quantitative, a single threshold can be applied to all cases for consistent delineation of contrast-enhancing lesion volume. The DSC-MR imaging volume was likewise coregistered to the contrast-enhanced T1-weighted images via the reference scan. The contrast-enhancing lesion volume ROI was transferred to the rCBV maps from which the rCBV mean and standard error of the mean could be determined using the ROI analysis tools available within OsiriX. Because subjects were their own control, mean estimates were modeled using generalized mixed modeling with sandwich estimation, assuming normal and log-normal distributions, in which observations were nested within each patient using SAS/GLIMMIX (SAS Institute Inc., Cary, North Carolina). Because residuals were heterogeneous (differences increased with increasing contrast-enhancing lesion volume), a log-normal distribution was also used. As a conservative effort, the Dunnett method was used for multiple comparisons, where P+/C+ was the control to examine whether the alternative approaches deviated significantly. Moreover, a Bonferroni correction was also used, where the P value was adjusted for 6 comparisons, 0.05/6 = 0.00833. The Lin concordance correlation coefficients (LCCCs) and Bland-Altman plots were calculated across all subjects for nRCBV and sRCBV obtained with 30°/P−/C−, 30°/P−/C+, and 60°/P+/C− protocols relative to the reference standard (60°/P+/C+). 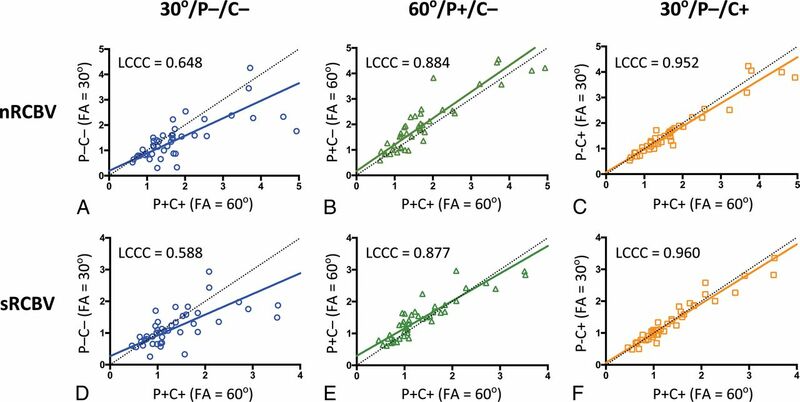 Unlike intraclass or Pearson correlation coefficients, the LCCC provides a measure of both accuracy (deviation from the line of equality) and precision (deviation from best-fit line) rather than precision alone. For methods showing strong agreement with the reference standard, a statistical equivalence test was performed. An equivalence test begins with the null hypothesis that the two tests are not equivalent, but if the 95% CI is contained in the margin, then the null is rejected and equivalence is confirmed for the chosen margins. where μ, σ, and δ are the mean, SD, and minimum of the baseline (BL) signal time points used for the rCBV calculations. The paired Student t test was used to compare the mean contrast-to-noise ratio with the reference standard and tSNR between the 30° and 60° acquisitions. Since January 2017, eighty-four subjects from 3 institutions have been enrolled in this study. Of these, 41 were excluded from analysis because of contrast-enhancing lesion volume <1 mL (n = 35) or the DSC-MR imaging image quality being insufficient for analysis (n = 6). The diagnoses for the remaining patients (n = 43) were grade IV glioblastoma (n = 29) and fibrillary and gemistocytic astrocytoma (n = 1); grade III anaplastic astrocytoma (n = 4) and anaplastic oligodendroglioma (n = 1); high-grade glioma with treatment effect (n = 1); grade II oligodendroglioma (n = 1) and astrocytoma with treatment effect (n = 1); grade II atypical meningioma (n = 1); cavernous malformation (n = 1); and metastases (n = 3). Sample images and parameter maps for a patient with glioblastoma are shown in Fig 2. The sRCBV maps are qualitatively similar for the 30°/P−/C+ (Fig 2D) and 60°/P+/C+ protocols (Fig 2F). 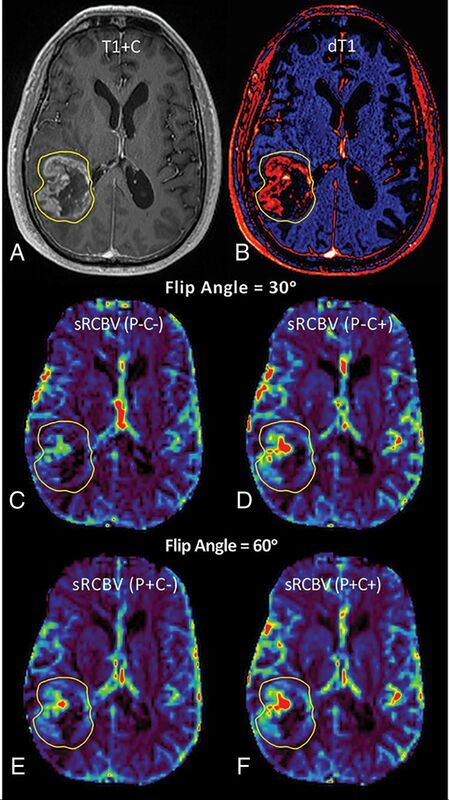 Images and sRCBV parameter maps from a patient with glioblastoma. Shown are the post-contrast T1-weighted (T1+C) (A) and quantitative dT1 (B) images with the corresponding sRCBV maps obtained from the first DSC-MR imaging contrast dose (C and D) without preload (P−) and without leakage correction (C−) and without preload (P−) plus leakage correction (C+). The sRCBVs obtained during the second contrast dose (E and F) and thus after the preload are shown without (P+C−) and with (P+C+) leakage correction. The results from all analyses are listed in Tables 1⇓–3 and plotted in Figs 3⇓–5. Table 1 gives the rCBV statistics for each of the 8 acquisition/postprocessing protocols and the P value indicating whether the mean rCBV is significantly different from the 60°/P+/C+ reference. The mean rCBV data are shown in Fig 3 for both nRCBV (Fig 3A) and sRCBV (Fig 3B). The sRCBV using the 30°/P−C+ protocol was not significantly different from the reference (P = .61), while the nRCBV was borderline different (P = .06). Normalized and standardized mean rCBV results. Mean nRCBV (A) and sRCBV (B) for each of the acquisition/postprocessing conditions without/with preload (P−/P+) and without and with leakage correction (C−/C+). The Lin concordance correlation (LCCC) results, including Deming regression (solid lines), for normalized rCBV (A–C) and standardized rCBV (D–F) for each of the preload (P) and leakage-correction (C) conditions in reference to the 60°/P+/C+ condition. The 30°/P−/C+ condition for both nRCBV (C) and sRCBV (F) has the best concordance. FA indicates flip angle. Bland-Altman results for normalized rCBV (A–C) and standardized rCBV (D–F) for each of the preload (P) and leakage-correction (C) conditions in comparison with the 60°/P+/C+ reference standard. The 30°/P−/C+ protocol for both nRCBV (C) and sRCBV (F) shows the best limits of agreement with minimal bias. There was excellent/substantial agreement22,23 between the 30°/P−/C+ protocol and the reference standard (60°/P+/C+), with LCCC values of 0.952 and 0.960 for nRCBV and sRCBV, respectively (Table 2). The nRCBV and sRCBV LCCC values were much lower for the 30°/P−/C− (0.648, 0.588) and 60°/P+/C− (0.884, 0.877) protocols. These results are depicted in Fig 4, with a Deming regression line and the identity line for reference. There was substantial improvement in the concordance provided by postprocessing leakage correction based on the sizable increase in LCCC between 30°/P−/C− and 30°/P−/C+ for both nRCBV and sRCBV. Likewise, the Bland-Altman plots (Fig 5) and associated bias values (Table 3) demonstrate that 30°/P−/C+ yielded substantially improved limits of agreement with minimal bias (μ = 1.89) compared with 30°/P−/C− and 60°/P+/C− protocols (14.64 and −10.13, respectively) for sRCBV, with similar results for nRCBV. Equivalence of the 2 measurements (30°/P−/C+ versus 60°/P+/C+) was determined for a ±10% change at a significance level of .01. For nRCBV and sRCBV, the difference of measurements (30°/P−/C+ versus 60°/P+/C+) in the log scale was −0.0517± 0.132 and −0.0191 ± 0.136, respectively. The 95% CIs for percentage change for 30°/P−/C+ compared with 60°/P+/C+ were (−9.12% to, −1.11%) for nRCBV and (−5.92%, −2.31%) for sRCBV. The P values of rejecting the 1-sided null hypothesis (H0: 30°/P−/C+ < 90% of 60°/P+/C+) were .00531 for nRCBV and .0000782 for sRCBV, indicating equivalence between the methods. For all protocols, there was no statistically significant difference between the tumor-to-white matter contrast-to-noise ratio with respect to the reference. The temporal SNR of the DSC-MR imaging signal was not significantly different between the 30°/P− and 60°/P+ acquisitions for white matter (P = .35), trended toward significance for tumor (P = .06), and was significantly different for gray matter (P = .008) with mean temporal SNRs of 2.11 and 2.22 for the 30°/P−/C+ and 60°/P+/C+ conditions, respectively. This study confirms the theoretic conjecture of recent simulations16,17,24 and demonstrates in vivo that low–flip angle, no-preload DSC-MR imaging has excellent/substantial concordance22,23 with full-dose preload-based, intermediate–flip angle DSC-MR imaging and should be considered for consensus protocol recommendation. It uses less contrast agent and requires fewer contrast agent injections, eliminating the potential error due to variable preload dosing and timing schemes. However, postprocessing leakage correction is impactful and essential, even for low–flip angle acquisitions with less T1-weighting. For this study, the ±10% difference chosen for the test of equivalence is clinically justified because clinically relevant rCBV changes of >10% have been frequently reported. For example, it was shown that for patients treated with topotecan, the percentage change in rCBV at 1 month for those with progressive disease was +12% versus −29% for those with nonprogressive disease (P = .02).33 Similarly, after treatment with radiation-temozolomide, patients with pseudoprogression had a mean decrease in rCBV of 41% and those with true progression had a mean increase in rCBV of 12%.34 In addition, in a multicenter clinical trial,5 all patients with a statistically significant survival advantage had a mean decrease in rCBV of 53% measured at 2 weeks after starting treatment with bevacizumab. Finally, another indication that the 10% margin is indicative of excellent agreement is the previously reported repeatability of the intermediate–flip angle technique (repeatability coefficient = 1.78),20 measured twice within a few days, which is worse than the estimated agreement in this study between the leakage-corrected low–flip angle and intermediate–flip angle techniques (repeatability coefficient = 0.59). The ability to obtain comparable rCBV measurements with up to 50% less contrast agent is a step toward addressing concerns regarding the use of suprastandard (>0.1 mmol/kg) contrast agent dosing. This is important due to recent restrictions imposed by the FDA on the use of gadolinium-based contrast agents due to the small-but-real risk of nephrogenic systemic fibrosis35 and more recent concerns regarding gadolinium deposition in the brain.36 Single-dose, low–flip angle methodology also improves the likelihood of performing DSC-MR imaging more routinely on both adult and pediatric patients because it would require no extra contrast agent beyond standard dosing for conventional T1-weighted postcontrast imaging and could be acquired during the standard bolus injection of contrast agent. In addition to reducing the contrast agent dose, the low–flip angle, no-preload protocol eliminates the potential for variability in measured rCBV resulting from variations in contrast agent incubation time. Hu et al11 demonstrated that with an incubation time of 5–6 minutes between a single or half-dose preload and bolus injection, rCBV could distinguish posttreatment-related enhancement from recurrent tumor. However, other than simulations showing little dependence of rCBV on incubation time,16,17,24 there are no other in vivo data addressing the potential influence of incubation time on rCBV measurements. By not using any preload, the low–flip angle protocol eliminates the chance that measured rCBV fluctuations due to inadvertent differences in incubation time could be mistaken for true differences in tumor rCBV. The complete elimination of the preload dose would be an important advancement for efforts to harmonize DSC-MR imaging acquisitions. Balancing the experimentally proven benefit of preload with the goal of maintaining total contrast dose near single-dose levels (0.1 mmol/kg) has resulted in several disparate dosing protocols. While many studies have reported clinically relevant results using a single-dose preload,9,11 others have used fractional preload doses consistent with the American Society of Functional Neuroradiology recommendation14 but unproven experimentally. Additionally, in an effort to comply with the contrast agent dosing and timing required for the consensus brain tumor imaging protocol,15 some have chosen to split the single dose between the preload and bolus dose, again without experimental evidence to justify this choice. Given the recent simulation results,16,17,24 there is concern that split-dose protocols will yield suboptimal rCBV estimations, potentially impacting decisions regarding the efficacy of clinical trials and the utility of rCBV as a treatment-response biomarker. Therefore, this study motivates adoption of a single-dose, no-preload protocol that would overcome current limitations regarding harmonization of DSC-MR imaging acquisition and dosing protocols. The temporal SNR was reduced in gray matter for the lower flip angle method, with a statistically significant difference in comparison with the 60°/P+/C+ method. Although no differences were found for white matter and tumor, a reduced SNR must be considered when balancing the benefits of using less contrast agent with a reduced SNR when using lower flip angle methods. Additional limitations of this study include a small number of patients and therefore necessitate performing a larger multicenter trial in which a greater range of tumor types and grades are studied. Also, as the simulations predict, low–flip angle methods may be less reliable compared with the preload/higher flip angle methods at 1.5T. Therefore, repeating this study at 1.5T is necessary to confirm the 30°/P−/C+ method as a general replacement for the reference standard 60°/P+/C+. Although statistical tests indicate excellent agreement, further evaluation of the repeatability of these methods and their ability to predict clinical outcomes are required. Finally, the results of this study were obtained using a single postprocessing platform. Thus, equivalent results obtained with other platforms cannot be guaranteed solely on the basis of the results reported here. This study provides experimental evidence showing that rCBV can be reliably determined using a single dose of contrast agent and a low–flip angle, no-preload acquisition at 3T. We thank Cathy Marszalkowski, Radiology Research Coordinator, who has played a key role in the recruitment of patients with brain tumor at the Medical College of Wisconsin, and the Robert C. Olson MD Endowment for providing support for Dr Kathleen Schmainda. Disclosures: Kathleen M. Schmainda—RELATED: Grant: National Institutes of Health/National Cancer Institute, Comments: U01 and R01 grants*; UNRELATED: Grants/Grants Pending: National Institutes of Health, Comments: several grants pending*; Stock/Stock Options: IQ-AI, Comments: ownership interest; Other: IQ-AI, Comments: spouse's salary. Leland S. Hu—RELATED: Grant: National Institutes of Health, Comments: U01 CA220378, R01 CA221938. * Christopher C. Quarles—RELATED: Grant: National Institutes of Health. * *Money paid to the institution. This work was supported by National Institutes of Health/National Cancer Institute: U01 CA176110 (K.M.S., M.A.P., S.D.R., J.M.C. ), R01 CA 082500 (K.M.S., M.A.P., S.D.R., J.M.C. ), U01 CA180820 (J.L.B., G.B. ), R01 CA158079 (C.C.Q. ), R01 CA221938 (K.M.S., C.C.Q., L.S.H., J.L.B. ), R01 CA213158 (A.S.), ADHS16-162414 (A.S.), R01 CA213158 (N.S. ), and U01 CA220378 (L.S.H.). Paper previously presented, in part, at: International Society of Magnetic Resonance in Medicine Annual Meeting and Exhibition and 35th Annual Scientific Meeting of the Congress of European Society of Magnetic Resonance in Medicine and Biology, June 16–22, 2018, Paris, France; and Annual Meeting of the American Society of Neuroradiology and the Foundation of the ASNR Symposium, June 2–7, 2018, Vancouver, British Columbia, Canada. Accepted after revision January 18, 2019.